This light up Irish angel Christmas tree topper has a gold Claddagh medallion and gold accents. Sorry, this Irish tree topper is sold out for the season. This light up Irish angel tree topper is UL listed. This Christmas decoration is a Irish angel tree topper that may also be used as a centerpiece. 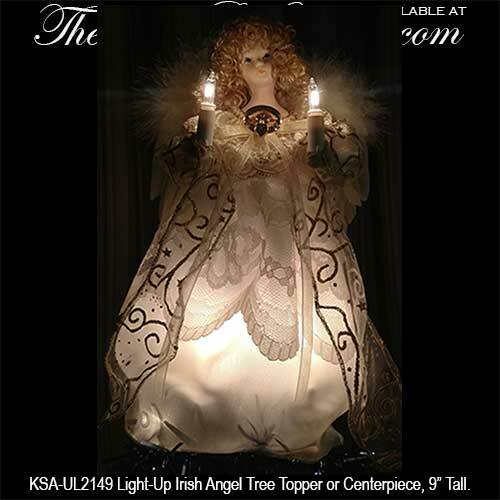 The 9" tall Irish angel tree topper is illuminated with 10 bulbs, 2 bulbs are held in her hands as candles. This Irish angel features curly blond hair and a Claddagh medallion; her gown is made of flowing white fabric and her hands and face are porcelain. This Christmas decoration is gift boxed with the Claddagh legend and is from Kurt S. Adler.